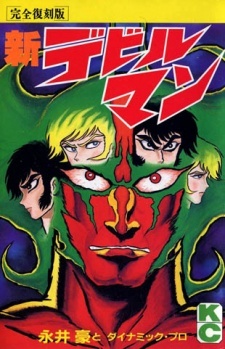 The story of Shin Devilman is supposed to take place between the second and third volume of the original Devilman series. Here we have Akria and Ryo who mysteriously manage to travel in time. Where they discover the have been sent back to dispatch demons that are invading history to end humanity. They visit several time periods including pre-World War Vienna, ancient Greece, France during the Hundred Years' War, Rococo period France, and wild west America. The end of this series also includes a new epilogue for the Devilman series. When you're creating a sequel to a previous work that has "New" or "Shin" in the title, you're normally setting a high bar for yourself. Shin Megami Tensei spawned a fantastic franchise that completely eclipsed its first few Megami Tensei games. New Super Mario Bros rejuvenated Mario's side-scrolling series and sold 30 million copies, and spawned a ton of sequels. There's probably some more examples but I don't feel like recalling them. But then there's Shin Devilman. The title may suggest something like a reboot, or a re-imagining, or a sequel. But instead of vastly expanding the Devilman universe, Shin Devilman goes for a more scaled-back approach. It confines itself to taking place in between volumes 2 & 3 of the original series. The basic premise is that Akira and Ryo keep jumping around to various periods in time to defeat some demons trying to alter history. Although there's still blood and dismemberment, the whole thing feels a bit more lighthearted then the original Devilman manga. There's even a little bit of homoeroticism squeezed in, which is always a nice touch. Each chapter has its own little exposition, climax, and conclusion, and it all happens in a span of 36 pages for each one. If you weren't satisfied with how the Devilman manga ended, then Shin Devilman's got you covered. The last chapter features an alternate take on the ending, for what that's worth. So overall, Shin Devilman isn't groundbreaking in any way, shape, or form, but it's a short spinoff that plays it very safe. The whole thing's only 5 chapters, so in the time it took you to read this review, you could have finished a chapter. If you're hungering for more Devilman, you could do much worse then this.